← Jupiter meets Uranus, sky falls in: Yes,no….or merely maybe? 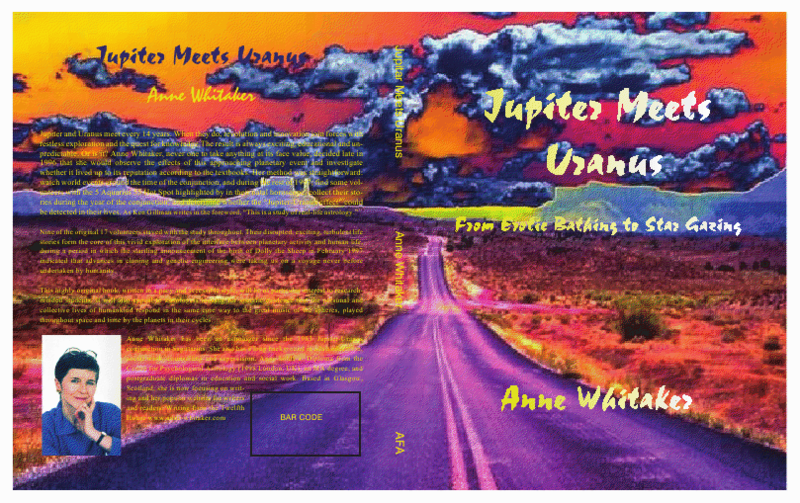 This entry was posted in Jupiter/Uranus conjunction 2010/11, Phase 1: 8th June 2010 (6 articles) and tagged "Jupiter Meets Uranus" by Anne Whitaker, 14-year Jupiter/Uranus cycle, Jupiter Uranus conjunctions, Jupiter/Uranus conjunction in Aries June 2010, Jupiter/Uranus conjunctions in Aries and Pisces of 2010/11, Jupiter/Uranus transits, Pluto in Capricorn, Uranus enters Aries May 2010. Bookmark the permalink. Marvelous post. I’m so glad you mention that astrology wounds. I have frequently thought in my 43 year astrological career, that perhaps I have done myself more harm with astrology than good: all those years of dread! I, of course, was very careful with clients to be positive and encouraging. Now my fireless self is shuddering at the Jupiter/Uranus on my mid-Heaven. But it is uncontrollable, and unprojectible. I saw Saturn coming to my Ascendant when I was 26 and I decided to be proactive and signed up for a class in Montana with Dane Rudyhar. Great idea, but the universe had other things in mind. The day that was picked out for me to give my brother a kidney was the day Saturn was exactly on my Ascendant and all the other planets were in square and horrible, including Pluto squaring my Venus in the 6th. How’s that for astrological joke? I couldn’t very well say, “Excuse me my brother needs to wait until my astrological situation is better”. Although perhaps I should have….To miss Dane Rudyhar…. thank you so much for your generous comment on this post, and for your revealing personal story which certainly illustrates the Liz Greene maxim which I am fond of quoting, to the effect that we should proceed as if we have free will – and will find out sooner or later where we haven’t…..
Dear Anne, I have just started reading through your articles and the different links. I have to say your work is amazing just as amazing as the daily news which corresponds almost exactly with everything for 2010 that you’ve written about! Wow! 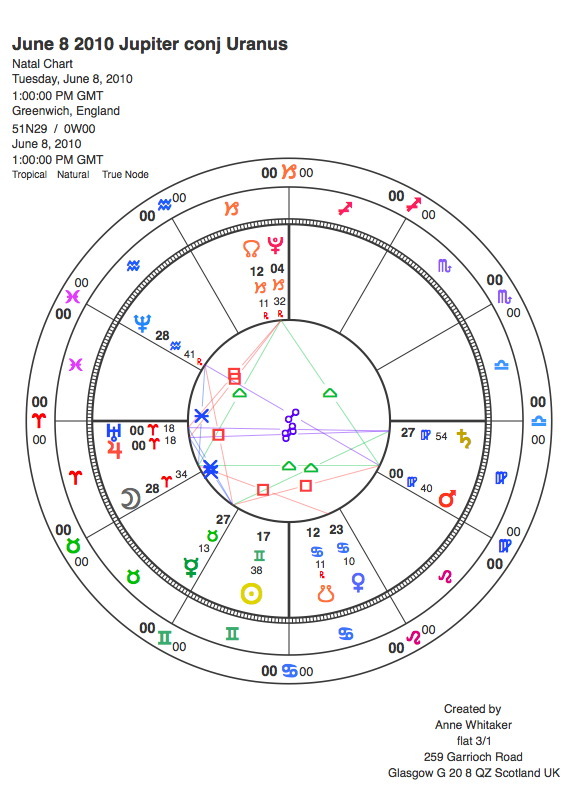 I’ve now traced back my history, born on 4th July 68, mom born on 21 Jan 41, and major events in my life which seem to say the same things re these planetary movements. I am in awe! thank you for your kind comments. And what you say reminds me of when I first started tracking major events in my and my family’s life through the movements of the planets. I recall that feeling of awe – and realisation that we truly are woven into a meaningful cosmos. Not at all! And thank you for your interest. many thanks for the heads-up! What a week – Uranus into Aries on Friday 28 May, Saturn goes direct 31st May, Neptune turns retro 1st June – then one week later, Jupiter meets Uranus….. we can see it all shaping up on the daily news….. I so love to read the breadth and depth of your inquiry into “a meaningful cosmos” secure knowing that the roots of your insightful wisdom are helping to keep me grounded at a time when my thoughts and feelings are adrift at sea,all the while, confidently nurturing my belief that there is purpose in my confusion, t.Neptune opposing my n.Mercury,and take heart reading your supportive words,” so limits get swept aside”, and the Jupiter – Uranus conjunction “opening us up to possibilities for growth as yet unknown”……. Uranus’ ingress in Aries is dead-on my IC and I am poised for the personal breakthrough of my life which if I can coherently record I look forward to sharing with you. And, thank you for the generous wealth of information you have thought to include as companion to your writing. I feel your life force vibrant in the green of Scotland. thank you for reporting in to ‘Ground Control’! It is just great to have you as one of us, intrepid band of researchees that we are, waiting to surf this wave of new disruptive energy. And thank you so much for these supportive words about my current writing. I see that many, many people are reading the articles and it is heartwarming for me to receive direct affirmation that what I have to say is helpful. Brilliant! Thanks for letting me know.